Since reading the book, Wild: From Lost to Found Along the Pacific Crest Trail by Cheryl Strayed, I, like many others, have been romancing the idea of a long-distance walk. And today the Larapinta Trail, a 223km walking trail along the West MacDonnell Ranges just outside of Alice Springs, became an even more attractive proposition when the Minister for Parks and Wildlife, Bess Price, unveiled a new Indigenous art project along the Trail at Simpsons Gap. “The Larapinta Trail continues to grow in popularity and prominence and receives regular recognition as one of the great long distance walks of Australia," Bess Price said. “We’ve listened to what visitors want and many have expressed a desire to learn more about the cultural values along the Trail. 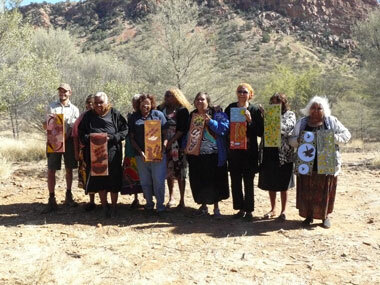 “Walkers stopping at shelters at Simpsons Gap, Jay Creek, Serpentine Gorge and Finke River will now be treated to stunning artwork depicting the cultural values and stories for the area,” she said, referring to the commissioned artworks which will now be on display at the four of the locations along the Trail. New shelters and amenities have also been developed, as well as new water facilities and interpretation signage and information packages. 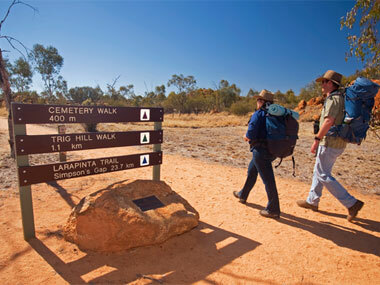 To find out more about the Larapinta Trail or to plan your walk, visit NT Parks and Wildlife and also the Larapinta Trail site. There are also some great photos taken along the Trail on this Facebook page.